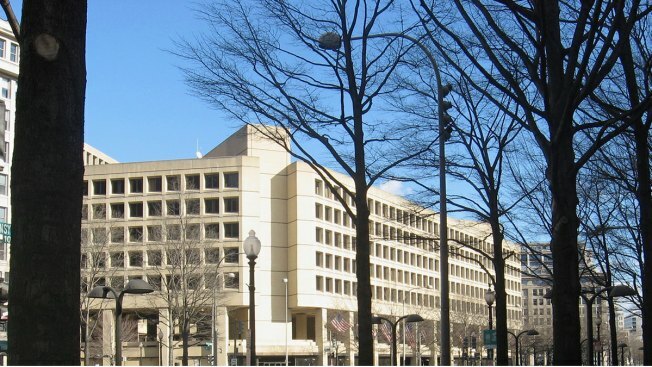 File photo of the J. Edgar Hoover Building (Federal Bureau of Investigation headquarters). Two computer hackers have been charged with sending false bomb and mass shooting threats to hundreds of schools in Britain and the U.S., including dozens in southern California, according to a federal indictment unsealed Tuesday. The defendants, according to an NBC News report, are members of the Apophis Squad, a worldwide collective of computer hackers intent on using the internet to sow chaos, the indictment says. Timothy Dalton Vaughn, 20, of Winston-Salem, North Carolina, was arrested Tuesday by FBI agents. The second defendant named in the indictment, George Duke-Cohan, 19, of Hertfordshire, United Kingdom, is serving a prison sentence in Britain for making a hoax threat targeting an airliner.